1929 Wurlitzer Band Organ Catalog Original text and illustrations. Videos, Wurlitzer Band Organ 125 Style Rolls. View and listen to restored organs using 125 Rolls. Videos, Wurlitzer Band Organ 150 Style Rolls. View and listen to restored organs using 150 Rolls. Videos, Wurlitzer Band Organ 165 Style Rolls. View and listen to restored organs using 165 Rolls. Videos, Wurlitzer Caliola. View and listen to Wurlitzer Caliola. Violano Virtuoso. Not Wurlitzer, but contemporary and worth a listen. This archive contains e-Rolls of Wurlitzer Band Organ music. The rolls can be played using my e-roll player programs eplay and eplayWin32. 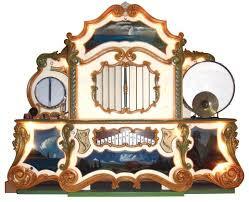 Wurlitzer Music Player. Continuously Play All The Wurlitzer Music. This music has been produced from original midi files made from scanned Wurlitzer 125, 150 and 165 paper rolls. As Wurlitzer paper rolls do not contain the full information necessary for playing correctly unless used on a real organ, I have added the omitted information using musical instruments with sounds similar to those of a real Organ. 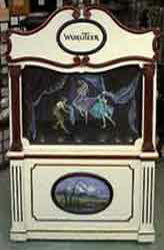 For details see How to Play Wurlitzer Band Organ Music Rolls. This music is in mp3 and ogg formats, both are good quality audio. This can be only a sample of the available Wurlitzer 125, 150 and 165 rolls, there are well over 250 more. The Wurlitzer Music Roll labels are not genuine. Rolls 3248 and 3135 are played using my software e-roll player eplay125, with Rich Olsen's Band Organ sound font. The style 150 paper rolls require different processing and different instrumentation to the 125 rolls. 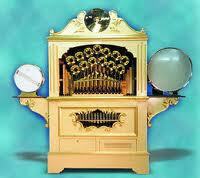 For details see "Playing Wurlitzer 150 Style Rolls" in the technical reference above. This music has been computer processed from original scanned Wurlitzer Rolls and is played on a fully instrumented Wurlitzer Style 153 Band Organ which has automatically operated Bells, Stops and Shutters. This adds interest to the music resulting in a greatly improved sound. Roll 13173 is played using my software e-roll player eplay150, with Rich Olsen's Band Organ sound font. Rolls 6502 and 6505 have been computer processed from original scanned Wurlitzer Rolls and are played on a fully instrumented Wurlitzer Style 165 Band Organ which has automatically operated Bells, Stops and Shutters plus superior percussion. Wurlitzer 165 Rolls. Played on a Style 165 Band Organ. Roll 404 was played using my e-roll player eplay165, with Rich Olsen's Band Organ sound font. This is Wurlitzer's "Classical Music" section. Played using my software e-roll player eplay165, with Rich Olsen's Band Organ sound font. 4. Roll 6528 "Length of a ten-tune roll"
5. Roll 6534A "Length of a ten-tune roll"
6. Roll 6537A "Length of a ten-tune roll"
A Caliola was designed to be played either manually using its built in keyboard or automatically using 65 note piano rolls.